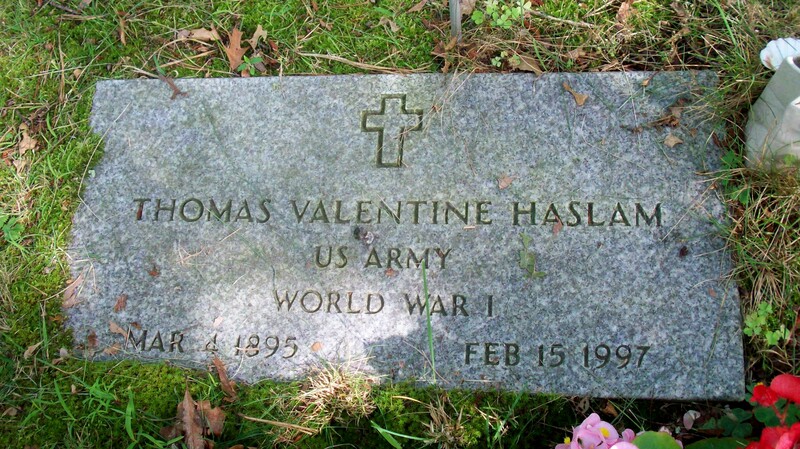 Died: February 15, 1997 in Cataumet Ma. Occupation: Keith Car Works, Mechanic for Noyes Garage in North Falmouth Ma. Where Lived: 1276 county Rd. in Cataumet Ma. Married: July 1, 1926 in Falmouth Ma. 1. Edith Elaine Haslam McAvoy; (Abt.1927 – ? ); Married Charles A. McAvoy in Bourne Ma. on July 22, 1950. 2. Patricia Anne Haslam McGowan; (August 14, 1928 – ? ); Married Robert Earl McGowan in Bourne Ma. on April 13, 1953. 3. 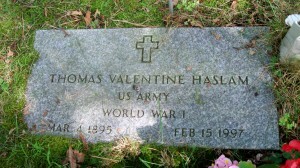 Russell Thomas Haslam; (August 26, 1934 – January 7, 2003); Married (1) Patricia A. Darsch & (2) Norma (–). 4. Kathleen Hope Haslam Burgess; (May 4, 1942 – ? ); Married Philip Hayes Burgess (1939 – ?) (Nathaniel Burgess & Gladys Ames Perry) in Bourne Ma. on July 25, 1964.